Abstract: This study explores the idea of Islamic banks requesting for collateral or guarantee when financing, the rationale for requesting loan security, and its acceptability from Islamic perspectives. The study reviewed the previous literature and Islamic injunctions to study and justify the use of collateral and guarantor to hedge the risk of financing default. It is found that Islamic banks like conventional banking system encourage requesting loan security to ensure borrowers’ commitment and protect investors’ wealth. Despite its effect on loan rejection, secured loans are found to be recovered more easily than unsecured loans. Government and Islamic banks are therefore advised to device mean for helping small-scale businesses to access financing, through credit guarantee schemes and participatory financing mechanisms, to enhance financial inclusion. Abstract: Well-being is a dynamic concept that includes subjective, social, and psychological dimensions as well as health-related behaviors. Adolescents form two-thirds of our population, this is a unique group of people with special needs. The study aims to identify the lifestyle and behavioral patterns of this group and subsequently come up with issues that require special attention. The Competitive environment in every field has propelled maladjustment in different spheres of life such as home, social, health, emotion and educational problems. In order to address adolescents’ psychological issues, it becomes everyone’s responsibility to give assistance to protect the future generation. Abstract: Energy is the lifeline for the whole of the service and industry sector in any country. Any imbalance in the energy sector is reflected on other sectors and the standard of living in the country. Energy problems are one of the most complex challenges facing governments. Especially in countries that rely on external energy sources. This situation is increased complexity by the presence of immediate changes in international relations and in fuel prices. Jordan is among the countries that depend on foreign energy sources and is located in the most volatile regions of the world in middle of the Middle East. Jordan is suffering from a permanent energy crisis that needs solutions which are compatible with many factors that may affect energy choices and decisions and alternatives available to get out of this crisis. Therefore, this study will attempt to focus on the Jordanian situation and identify the challenges and available choices. A comparison will be made of the available alternatives through Analytical Hierarchical Process (AHP). The results show that the priority of the energy solutions is to expand the mining of uranium and shale as well as to expand the construction of renewable power plants, as well as maintenance and modernization of existing plants and the establishment of new refineries. Abstract: The basic aim of this study is to investigate that whether the dividend policy makes an impact on the firm performance in Pakistan specially in cement sector. Data used have been collected from annual reports of the sample companies and website of Pakistan Stock Exchange from 2012 to 2016. The results of OLS indicate that there is an insignificant positive relationship between return on equity (ROE) and Dividend per share (D.P.S) which imply that by increasing cost dividend per share, return on equity increases for the selected companies. Furthermore, a significant positive relationship between earning per share (EPS) and return-on-equity (R.O.E) was found. In the case of firm size, significant relationship was found with ROE and financial leverage showed an insignificant relationship with firm performance (R.O.E). Hence this study supports the relevant theories of dividend policy. Abstract: Self-driving cars promise to revolutionize the automotive industry. Besides being productive and fuel-efficient, they would be significantly safer than the human-operated cars. However, in the rare case when they do get into an accident, they can calculate and opt for the reactive measure to take based on their programming. The manufacturer, it seems, must decide the ethics that self-driving cars should follow in such scenarios. In circumstances where they must choose between the lives of the passengers and the pedestrians, some researchers have argued that the best solution is to choose for the safety of the passengers over the pedestrians. Such a strategy, they argue will make sense as cars will have better control over the passenger and, therefore, will help in faster adoption of self-driving cars. However, this line of thinking seems simplistic at best. The author suggests areexamination of the ethical issues while taking into account the social and technological aspects as well. Abstract: Medstar Health was the target of ransomware attack in 2016. The attack impacted the provision of healthcare services to the patient. Medstar opted not to pay the ransom and, instead, responded by shutting down its electronic medical record (EMR) systems and restoring the data from the backups. The paper analyzes the event, Medstar’s response and its negligent behavior that allowed the vulnerability to be exploited. The author provides an ethical position statement and recommendation to reduce the chances of any future attacks. 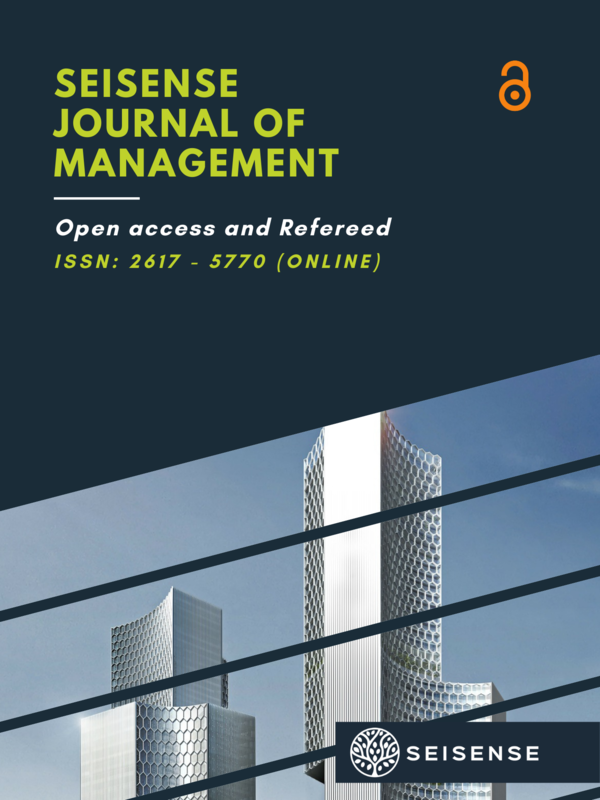 Abstract: The study is an outcome of a conceptual framework that establishes the relationship between the total quality management (TQM) practices and supply chain management (SCM) practices. The six TQM practices have taken from the Malcolm Baldrige National Quality Award (MBNQA). These practices are leadership, strategic planning, customer focus, human resource management, process management, and information analysis. The result is based on the logistics sector in Pakistan. Data is collected from 270 operation manager and top management. Multiple regression analysis is used to derive the results from the collected data. The result shows the strong relationship between the variables. Leadership, strategic planning, customer focus, and human resource management relationship with SCM was found significant. However, process management and information analysis were insignificant relationships with SCM. This study can be used for the implementation of both the systems – TQM and SCM in the organization to drive better results. Abstract: Bitcoin is a type of cryptocurrency and the most successful in blockchain management. It has become famous in recent years. The critical aspects of cryptocurrency are its legitimacy, source of money laundering, tax evasion, lack of regulation etc. The aim of this study is to explore the view of Muslim scholars on the legality of bitcoin with respect to Shariah. The study adopts doctrinal approach which utilizes descriptive approach of qualitative research methodology which relies on secondary data in form of text books, journals, newspapers, related websites etc. The study found that Muslim scholars are divided on the issue. A part of them completely rejected bitcoin and considered it against Shariah principles. On the other hand, some Muslim scholars believe bitcoin does not contradict Islamic principles and therefore may be used, however with certain conditions. The researchers tend to support the proponents’ view as most of the opponents’ grounds for the rejection are temporary in nature which may be covered through policy regulations. Abstract: This study measures whether the mergers generate efficient, trustworthy and wide-ranging capital base for the bank that completely comprised mergers and to what range mergers of banks increase the confidence of the investors, the customers, the shareholders and capacity to finance the real time sector. For the purpose total 9 ratios under profitability ratios and other ratios applied on key financial figures to analyze the selected bank performance. Key figures were taken from the website of the NIB bank. Data was taken from 2004-07 before merger and 2008-12 after the merger. Abstract: The work of Nick Bontis divided into following categories 1. Intellectual capital management which refers to knowledge of a company's employees collectively. Dr. Nick develops a matrix of intellectual capital. 2. Organizational size and Knowledge flow, it describes the flow of information and technical knowledge with respect to learning. Dr. Nick explains the knowledge flow in up and down stream according to the size of organization 3. The organizational learning process in different setting e.g. Group learning and individual learning and their outcomes in diverse cultures. The group learning is more result oriented and cost effective instead of investing on individuals. 4. Managing organizational learning system Aligning Knowledge flow and stock of knowledge. 5. The theory of resource base view of the firms, describe the utilization of resources as competitive advantage. Resources are divided into tangible and non-tangible. This writes up is an effort to explore the areas he has contributed. Abstract: The study is an investigation of transformational leadership impact on organizational performance; the mediating role of organizational innovation. The study revealed that organizational innovation has mediated significant impact on organizational performance. The research found that transformational leadership and organizational performance has strong relationship. Therefore, it will help the managers to create such leadership style in the organizations. Pakistani organizations need an environment where leaders motivate and encourage the employees who are wishing to become more creative and effective in leading the successful organizations. Abstract: Aim of this study is to provide the information to the bankers, government authorities, employees and the investor of the financial institutions about the impact of the merger on the performance of the banks. For this purpose, financial ratios such as the liquidity ratio, loan to deposit ratios are measured to see the short term paying capacity of the banks. Investment ratio such as earning asset to total asset ratio; solvency ratio such as “deposit time capital”; equity capital to total asset, profitability ratios include the interest margin to earning asset are used to analyze the impact of merger and on bank performance. By using ratio analysis, the study concludes if the merger and have a positive relationship with merger. Abstract: The notion of Corporate Social Responsibility (CSR) seems appealing amidst unprecedented corporate affluence and power vis-a-vis abject socio-economic and deteriorating environmental conditions. An increasing number of corporations have started exploiting social responsibility as insurance strategy against government intervention, media reporting and consumer reaction to irresponsible corporate behaviour. Analyzing retrospectively, current Social Responsibility Practices are far away from letter and spirit. This article aims to present critique of concept and practice of CSR. This phenomenological study, analyzing corporate practices, explores the ulterior motives precipitating corporations espouse CSR and finds that Social Responsibility is not social, it is economic phenomenon. The proposed model of CSR can make it social, sustainable and provide much-needed impetus to practice. Abstract: The study is conducted to highlight the employees’ perspective of CSR in the banking sector of Pakistan and its impact on their job attitudes: job satisfaction and organizational commitment. Primary data were collected from 177 employees working in 22 different banks of Lahore (Pakistan). Stratified random sampling technique was used for sample selection. The population included all the banks in Lahore. Results show the existence of a direct relationship between a) CSR and Organizational Commitment b) CSR and Job Satisfaction. Moderating Effect of Neuroticism and Extroversion. Abstract: The study is an association study because the relationship between employee turnover intentions and HR practices is studied by taking moderation effect of neuroticism and extroversion. The hypotheses are tested by taking Banking Industry in context of Pakistan. This tested the relationship of different independent factors (HR practices) with employee turnover intentions, the major causes among them, and the magnifying effect of neuroticism and extroversion, and its significance thereon. Data is collected through self-administered questionnaires and is analyzed by using different analytical techniques in SPSS including regression analysis, principal component analysis and descriptive statistics. Abstract: The study focuses on the analysis of the causality between poverty and crises in northern Nigeria using the Granger causality test and the ARDL bound testing techniques. The study revealed the presence of causality running from poverty to crises and not the other way round as well as co-integration among the pairs. The long-run estimate thus showing poverty exhibiting a positive effect on crises which deviates from the negative relationship obtained in the short-run. The study thus recommends employing poverty reducing mechanism in the region coupled with the overhauling of the agricultural sector as most of the labor force in the region are unskilled which can be easily absorbed in the sector. Abstract: The aim of this research is to identify the relationship between financial leverage and the performance of Textile Composite Companies of Pakistan. Pakistan Textile Composite Companies which are listed in PSX (100-index) are selected.5-year data is collected from 2011-2015 and top 16 companies are selected as a sample. Using descriptive statistics, correlation analysis, and a regression model to identify the results. Results show that financial leverage has a negative and significant effect on firm ROE and financial leverage has a positive and significant effect on firm ROA. Further study indicates that the high-interest rate and more amount of debt decrease the value of equity and has a negative impact on firm performance. On the other hand, the amount of debt has a positive impact on firm ROA. Results show that financial leverage has a positive impact on firm performance if the amount of debts do not exceed the amount of equity. Abstract: The purpose of this study is to investigate the role of inflation, exchange rate uncertainty, gross domestic product (GDP) and presence of military government in FDI inflows in Pakistan. Annual data from the 1991-2013 is used to validate the results of the studied variables by using OLS regression. According to the expectations inflation, exchange rate and GDP are significant determinants of the FDI in Pakistan during the period of the study but the presence of military government (MG) has not significant effect on the inflow of the FDI in Pakistan. Abstract: It is evident from the past research that employees who perceive the organizational policies as not just, the employees tend to leave the organizations and start their professional career in other organizations where they feel comfortable and organization policies as fair and just. Literature accords the moderate relationship of job embeddedness on turnover intentions. This study analyzed the moderate relationship of job embeddedness on turnover intentions and organizational justice in banking sector of Pakistan. Sample of study consists of 313 banking employees from different cadre. Regression Analysis was used to analyze the data. Results clearly indicate that job embeddedness do not moderate the relationship of turnover intentions and organizational justice. There is further need to explore the role of job embeddedness in other professional organizations. Implications for management and future directions are discussed. Abstract: This essay is a philosophical enquiry into the dogma of profit maximization as one of the dogma premises of capitalism. Being attracted by the cyclical nature of financial crises as an existential challenge the case is argued to be biased and undemocratic in presence of profit maximization as a guiding principle. Philosophy as un-dogmatic procedure seems suitably sustained to keep the notion of maximization alive and leaves ground to draw valid arguments considering theory of greater good and justice. The epistemological approach to understand the efficiency argument as defended seems vague to establish justice, stability and economic democracies. Bottom up approach may resolve the issue using evident and biased ruling of interest tax deductibility under maximization approach and gain greater good and justice at all levels. According to reasonable judgment of consequences “equitable and sustainable wealth creation” tends to be more valid corporate guiding principle negating “maximization of profit”. Abstract: The study aimed to identify the determinants of the technical efficiency of Smallholder Tea Farmers (STFs) under UTZ certification system in Sri Lanka by employing stochastic production frontier using a sample survey of 75 STFs supported by the UTZ programme conducted between January and March in 2016. The results showed that a small number of STFs (11.8 percent) were over 90 percent efficient and the level of efficiency was found to be negatively related to coefficients of UTZ certified STFs and positively related to number of years with the same plants. The results further showed the labor and fertilizer were the significant factors that determine the tea production of STFs. Abstract: The goal of the paper is to find the characteristics which can lead to an effective performance management systems. The paper suggested a model with a set of characteristics in three critical intervals for the performance management process: when identifying performance objectives, when measuring performance, and when developing performance. Abstract: This study examines the relationship between role space and organizational commitment among the sales professionals in the Kingdom of Saudi Arabia. Moreover, the study also examines the relationship between organizational commitment and employee perception about the organization they work for. The data were obtained from 148 sales and retail professionals. The gathered data were then analyzed by using suitable statistical tools. The results demonstrate that role space is significantly and negatively related to overall commitment among the selected respondents. Employee perception of the organization is found significantly positively related to affective commitment, normative commitment, and overall commitment. Regression analysis indicates that the change in overall OC is explained by 43.5% resulting from a change in the selected independent variables. Abstract: Turnover intention has attained substantial consideration in last few decades and has been comprehensively studied because of its deep implications towards today’s organization. Current study attempts to examine the relationship between Human Resource practices and turnover intentions by taking moderating effect of personality traits. This conceptual framework takes into account one dependent variable i.e. Turnover Intention and three independent variables i.e. Pay Satisfaction, Performance Appraisals, Career Management and two moderating variables i.e. Neuroticism, Extroversion. Abstract: Banks plays vital role in capitalist economy. During the period of financial turmoil, it has been viewed that banks lost a huge capital due to non-recovery of loans from customers. Since there are two type of banks working in Pakistan therefore this thesis analyse which banks performance was better during the financial crunch between 2008 - 2012. The objective of this thesis is to determine the factor affecting the profitability of Islamic and Conventional banks in Pakistan during the period 2008 – 2012. Data was collected through financial books of seventeen conventional and five Islamic banks. Two dependent variables i.e. Return on Asset and Return on Equity were used to determine the profitability of Islamic and conventional banks in Pakistan. Whereas Liquidity, Credit Risk, Capitalization, Efficiency, Bank Size, Economic Performance, Inflation and a dummy variable were used as Independent variables. Panel Data analysis is used to find out the result of secondary data. Initially the analysis was conducted on whole industry, which then applied on Islamic and Conventional banks separately. Abstract: Objective – An empirical investigation to assess the impact of the bank-affiliated business group on firm’s capital structure decisions. Design/methodology/approach – A sample of 146 group affiliated firms and subsamples for bank and non-bank affiliated firms was analyzed with random-effect panel regression model to determine the relationship of the bank-affiliated business group on firm’s capital structure determinants of listed firms in Pakistan using data for 2006-2011. Findings – We have found that bank-affiliated firms financing decisions are significantly different from that of non-bank affiliated firms with a common factor of the internal capital market. Bank-affiliated firm capital structure determinants of growth, asset tangibility, non-debt tax shield and operating risk show significantly different association with choice of leverage compared to non-bank affiliated firms. Policy implications – Our results show that group affiliated firms particularly bank-affiliated firms are the reason for market imperfections and have successfully eliminated the market distortions keeping others at a disadvantage. Hence, Policymakers are suggested to improve the regulatory system and its implementation. Originality/value – According to best of our knowledge, this is the first study to extend the literature of firm financing decisions in relation to bank-group affiliation in Pakistan.